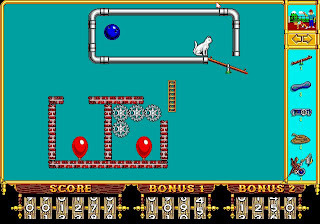 The Incredible Machine is a series of computer games that were published by Sierra. 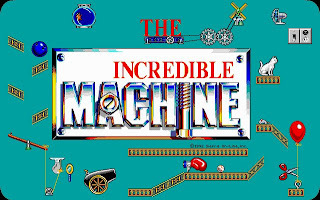 The Incredible Machine were released in 1992. It support high resolution 640x480 16-color VGA graphics and Sound Blaster for some digitized sound effects. The general objective of the games is to arrange a given collection of objects in a needlessly complex fashion so as to perform some simple task, like "put the ball into a box" or "pop all balloons". Available objects ranged from simple ropes and pulleys to electrical generators, bowling balls and even cats and mice. The levels usually have some fixed objects that cannot be moved by the player, and so the only way to solve the puzzle is carefully arrange the given objects around the fixed items. There is also a "freeform" option that allows the user to "play" with all the objects with no set goal or to also build their own puzzles with goals for other players to attempt to solve. The games simulated not only the physical interactions between objects, but also ambient effects like varying air pressure and gravity. The engine does not use a random number generator in its simulation of physics, assuring that the results for any given "machine" are reproducible. 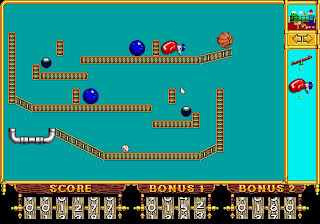 The Incredible Machine shows the early physics simulations capabilities in computer games, and I was quite amazed by it when I first play it some where around 1995. You can download it here.